Learn the science of yoga in all its aspects. Find out why your current yoga practice might not be serving you as fully as it can. Yoga, in original context of ancient India, was intended for mind and body control and realization of the true self. Most modern practices fall short of yoga’s intended use. The science of yoga ties into the science of the soul and achieving the ultimate destiny of the soul—and that topic opens a broad range of philosophical discussion. All points are comprehensively addressed here. 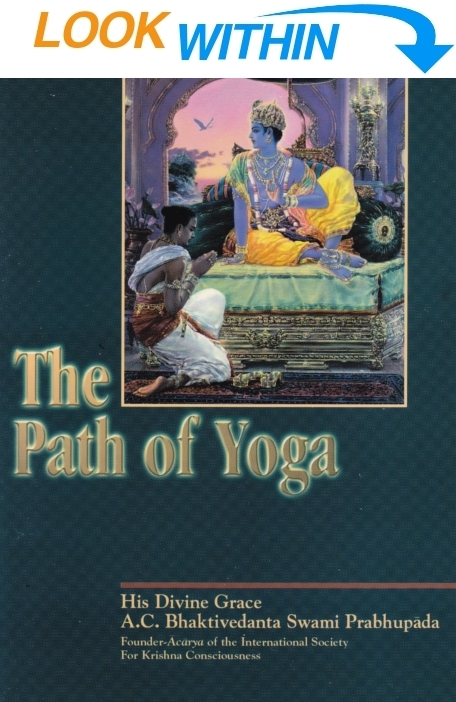 The path of perfection consists of a historic series of talks—elaborations on a previously published commentary—by His Divine Grace A.C. Bhaktivedanta Swami Prabhupada (1896–1977) on India’s greatest spiritual classic, the Bhagavad-gita. In these absorbing talks, Srila Prabhupada explores deeply the philosophy of yoga as explained in the Sixth and Eighth Chapters of the Gita, showing clearly how these timeless teachings apply to twentieth century mankind. Srila Prabhupada’s talks probe questions concerning the nature of consciousness, techniques of meditation, karma, death, reincarnation, and even spiritual ecstasy. In the Sixth and Eighth Chapters of Bhagavad-gita, Lord Sri Krishna, the Supreme Personality of Godhead, explains that the eightfold yoga system is a means to control the mind and senses. This method, however, is very difficult for people to perform, especially in this age of Kali, an age characterized by ignorance and chaos. Although this eightfold yoga system is particularly recommended in the Sixth Chapter of Bhagavad-gita, the Lord emphasizes that the process of karma-yoga, action in Krishna consciousness, is superior. In this world, everyone acts to maintain his family, and everyone is working with a view to some self-interest, or personal sense gratification, be it concentrated or extended. But to act perfectly is to act in Krishna consciousness, and this means acting detached from the fruits of labor. Sometimes sannyasis (renunciates) incorrectly think that they have become liberated from all material engagements and therefore no longer have to perform agni-hotra yajnas, or fire sacrifices. This is a mistake. Certain yajnas (sacrifices) have to be performed by everyone for purification. Since sannyasis are not traditionally required to perform yajnas, they sometimes think that they can attain liberation by ceasing to perform the ritualistic yajnas, but actually, unless one comes to the platform of Krishna consciousness, there is no question of liberation. Those sannyasis who cease to perform yajnas are in fact acting out of self-interest, because their goal is to become one with the impersonal Brahman. That is the ultimate goal of the impersonalists (Mayavadis), who have one major goal or demand: to become one with the supreme impersonal Being. The devotees have no such demands. They are simply satisfied in serving Krishna for the satisfaction of Krishna. They do not want anything in return. That is the characteristic of pure devotion. “O Almighty Lord, I have no desire to accumulate wealth, nor to enjoy beautiful women. Nor do I want any number of followers. What I want is only the causeless mercy of Your devotional service in my life, birth after birth.” In essence, this is the bhakti-yoga system. There are many examples of the pure devotional attitude. Once Lord Nrisimhadeva told Prahlada Maharaja, “My dear boy, you have suffered so much for Me. Whatever you want, ask for it.” Being a pure devotee, Prahlada Maharaja refused to ask for anything. He said, “My dear Master, I am not carrying out mercantile business with You. I will not accept any remuneration for my service.” This is the pure devotional attitude. Yogis and jnanis are demanding to become one with the Supreme because they have such bitter experience suffering the material pangs. They want to become one with the Lord because they are suffering in separation. A pure devotee, however, does not experience this. Although separate from the Lord, he fully enjoys the service of the Lord in separation. The desire to become one with the impersonal Brahman, or to merge with God, is certainly greater than any material desire, but this is not without self-interest. Similarly, the mystic yogi who practices the yoga system with half-open eyes, ceasing all material activities, desires some satisfaction for his personal self. Such yogis are desirous of material power, and that is their conception of the perfection of yoga. Actually, this is not the perfection of yoga, but a materialistic process. If one practices the regulative principles of yoga, he can attain eight kinds of perfection. He can become lighter than a cotton swab. He can become heavier than a great stone. He can immediately get whatever he likes. Sometimes he can even create a planet. Although rare, such powerful yogis actually exist. Vishvamitra Yogi wanted to beget a man from a palm tree. He was thinking, “Why should a man have to live so many months within the womb of his mother? Why can’t he be produced just like a fruit?” Thinking like this, Vishvamitra Yogi produced men like coconuts. Sometimes yogis are so powerful, they can perform such acts, but these are all material powers. Ultimately such yogis are vanquished, because they cannot retain these material powers indefinitely. Bhakti-yogis are not interested in such powers. The bhakti-yogi, acting in Krishna consciousness, works for the satisfaction of the whole without self-interest. A Krishna conscious person does not desire self-satisfaction. Rather, his criterion of success is the satisfaction of Krishna; therefore he is considered the perfect sannyasi and the perfect yogi. A pure devotee does not even want salvation. The salvationists want to be saved from rebirth, and the voidists also want to put an end to all material life. Chaitanya Mahaprabhu, however, requested only devotional service to Lord Krishna, birth after birth; in other words, Chaitanya Mahaprabhu was prepared to endure material miseries in one body after another. What, then, was Chaitanya Mahaprabhu’s desire? He wanted to engage in God’s service, and nothing more, for that is the real perfection of yoga. The Path of Yoga explains the highest standard for human beings, the practice of the science of self-realization, bhakti-yoga. A chronicle of an historic series of talks by Srila Prabhupada, who has been acclaimed by scholars as the greatest exponent of the Indian spiritual tradition, this book deeply probes the nature of consciousness, meditation, karma, death, and reincarnation. He prescribes a simple process to purify the mind and elevate the consciousness—a process that assures readers no only inner peace but the power to change the chaotic trend of modern society.